To 14th April – Easter art exhibition, Fine Foundation Wild Seas Centre, 10.30am – 5pm; work inspired by nature and the sea by DWT volunteers. To 14th April – Get Dorset Buzzing Roadshow, Chesil Beach Centre, with family games including the Pollinator Wheel of Fortune and the Bee Buzz wire game. There will be plenty of information about welcoming pollinators into your garden and wildlife gardening merchandise. Sign up for the Get Dorset Buzzing campaign for free advice and offers to help you do at least one thing for pollinators in your garden this year. .
Tuesday 9th – Slimy Seaweeds, Gardens under the Sea, 2.30– 4pm. ; learn fascinating facts, how to identify seaweeds and have fun pressing them. No booking required. Fine Foundation Chesil Beach Centre. Wednesday 10th – Caterpillar Kids at Lorton, Minibeasts of the Wild Woods, Lorton Meadows Conservation Centre, Weymouth, 10.30am – 12.30pm. Family fun, wildlife inspired crafts and games. Booking essential on 01305 816546. Thursday 11th – Wool paintings, fun family crafts at the Fine Foundation Wild Seas Centre, 11am – 2pm. Join local artist Madelaine Devenay and create your own wool painting. Design a seascape, landscape or sea creature using wool to add texture and colour. No booking required. Friday 12th – Bugs and Beasties of Chesil, 11am – 12.30pm. Learn about the amazing insects that call Chesil home and discover ways in which you can get more amazing bugs and beasties in your garden. No booking required. Fine Foundation Chesil Beach Centre. East Dorset Reserves, illustrated talk by Andy Fale, Warden at Upton Heath, about the variety of habitats and species associated with each reserve and how DWT manages them; Quarterjack Suite, Allendale Centre, Wimborne, 7.30pm. Saturday 13th – Walk with a warden on Brownsea Island, 11am – 1pm; two-hour guided walk to see the spectacular spring time wildlife of Brownsea Island nature reserve. Booking recommended. Please call Brownsea on 01202 709445. Sunday 14th – Bournemouth Natural Science Society family spring weekend, 10am – 4pm; Get Dorset Buzzing roadshow (entry charges) 39 Christchurch Road, Bournemouth, BH1 3NS. Monday 15th to Sunday 21st – Get Dorset Buzzing Roadshow, Lorton Meadows Conservation Centre, with family games including the Pollinator Wheel of Fortune and the Bee Buzz wire game; information about welcoming pollinators into your garden and wildlife gardening merchandise. Plus sign up for DWT’s Get Dorset Buzzing campaign for free advice and offers to help you do at least one thing for pollinators in your garden this year. Monday 15th – Arty ocean activities, Fine Foundation Wild Seas Centre, 11am – 4pm; ocean-themed have-a-go arts and crafts for children. Drop in at any time during the event. No booking required. Chesil Strandline Detectives, Fine Foundation Chesil Beach Centre, 11am – 12.30pm; walk along Chesil Beach and hunt the strandline for wildlife treasure washed in from the sea. No booking required. 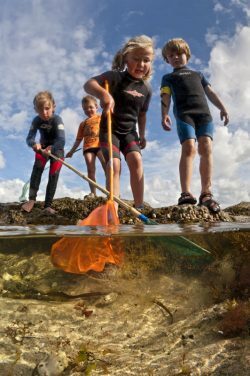 Crab Watch, search for and record crabs on the seashore, Fine Foundation Wild Seas Centre, 11am – 1pm. Learn more about crabs, the different species that can be found and how to record them. Then join a seashore expedition to search for crabs and carry out a Crab Watch survey. Small charge..
Talk by Imogen Davenport to encourage us all to garden for wildlife, 7.30pm, Digby Memorial Church Hall, Sherborne, DT9 3NL. DWT is running its first Dorset wide campaign to promote gardening for wildlife. Contact Lynne Doodney 01935 814779. Thursday 18th – Chocolate making workshop, 9.45am – 4pm. This chocolate artistry workshop will enable you to create your own colourful chocolates each with delicious fillings, just in time for Easter. www.kingcombe.org. Walk with a warden on Brownsea Island, 11am – 1pm; guided walk with a warden to see the spectacular spring time wildlife of Brownsea Island nature reserve. Booking recommended. Please call Brownsea on 01202 709445. Caterpillar Kids at Lorton, Tiny Tadpoles, 1.30 – 3.30pm. Explore the wildlife pond, discover amphibian lifecycles – frogs, newts and toads, with games and art. Booking essential, please phone 01305 816546. Lorton Meadows Conservation Centre. .
Friday 19th – Great Chesil Eggcase Hunt, 11am – 12.30pm. An egg hunt with a twist! Help search for shark and ray eggcases, and maybe find some of the chocolate variety. No booking required. Fine Foundation Chesil Beach Centre. The Great Kimmeridge Eggcase Hunt, 2 – 3.30pm. Hunt for empty egg capsules washed onto the beach at Kimmeridge Bay to win a chocolate egg reward! Fine Foundation Wild Seas Centre. Saturday 20th – Seashore Safari, Fleet Lagoon, 12.30 – 2pm. Join DWT at low tide to explore the amazing underwater world of the Fleet Lagoon. No booking required. Chesil Beach Centre. Sunday 21st – Lorton Meadowss Eggsplorers Trail, 10.30am – 4pm. Become an amazing eggsplorer for the day! Collect a trail guide, hunt for clues and claim your edible prize! Tuesday 23rd – Guided Walk, Local Landscapes and Garden entry, join DWT’s Nicky Hoar and Knoll Gardens’ Neil Lucas on a guided walk across Ferndown Common to Knoll Gardens to understand more about the horticulture and wildlife of this part of east Dorset. Meet at Knoll Gardens, BH21 Booking on 01202 692033. Get Dorset Buzzing event. Thursday 25th – Wildlife Wellbeing Walk at Chesil, 11am – noon. This walk is dementia friendly, and particularly suitable for anyone wishing to discover the outdoors, lose weight, recover from illness or wanting to improve their mental health and wellbeing. Over 18’s only. No booking required. Free event. Fine Foundation Chesil Beach Centre. Great Dorset Beach Clean, 11am – 1pm. Please bring your own gloves and litter pickers if you have any, but equipment can be provided. Groups of 6+ must register before the event, 01305 206191. Fine Foundation Chesil Beach Centre.